Emory University President James Wagner today announced the appointment of Michael J. Mandl to the position of president and CEO of Emory Healthcare. Mandl has served Emory University as executive vice president for business and administration since joining Emory in 2003. In this capacity, he has served on the Emory Healthcare Board of Directors, and was appointed chair in September 2014. He is also a member of the Board of the Emory Saint Joseph’s Joint Operating Company. "Emory Healthcare is very strong and well positioned to meet the challenges of the market going forward,” says Douglas Ivester, chair of the Robert W. Woodruff Health Sciences Board and a member of the Emory University Board of Trustees. “We have enjoyed the strong leadership of John Fox for the past 16 years, and Emory is indeed fortunate to have an exceptionally thoughtful and talented leader like Mike Mandl to assume the CEO position going forward. We have worked closely with Mike in his current position and know him to be fully committed to the mission and people of Emory Healthcare. 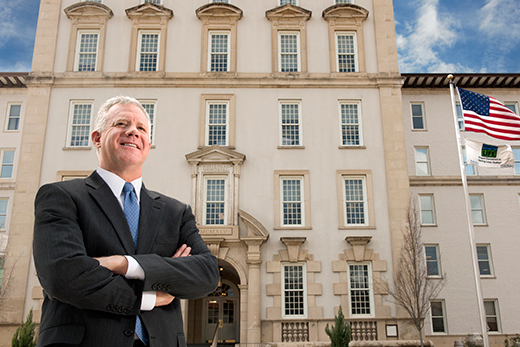 Mike has an unwavering commitment to our patients and to Emory's research and education missions." In his new role as president and CEO of Emory Healthcare, Mandl will serve one of the Southeast’s largest and most comprehensive health care systems. Emory Healthcare is composed of Emory University Hospital, Emory University Hospital Midtown, Emory University Orthopaedics & Spine Hospital, Emory University Hospital at Wesley Woods, Emory Saint Joseph’s Hospital, Emory Johns Creek Hospital, Emory Rehabilitation Hospital in Partnership with Select Medical, Emory Clinic, Emory Specialty Associates and the Emory Healthcare Network. Emory and WellStar Health System recently announced formal discussions regarding potentially combining Emory Healthcare and WellStar into a new, independent 501(c)(3) health care entity. Mandl, in close partnership with Emory’s Woodruff Health Sciences Center leadership, has led those discussions on behalf of Emory since their inception and will continue to do so. In addition to his role as an executive vice president overseeing the business areas of Emory, Mandl is also the board chair for Emory Innovations, Inc., which was created for innovative new enterprises including the Drug Innovation Venture (DRIVE), and of EmTech, Inc., an enterprise established in partnership with Georgia Tech. Since joining Emory, Mandl has also built strong ties throughout Metro Atlanta. He currently serves on the Executive Committee of the Board for the Midtown Alliance and has served the metro community through nonprofit board appointments, including the Metro YMCA and The Fernbank Museum. Prior to Emory, Mandl served as a vice president at Duke University and was a member of the senior leadership team, working closely with both university and health system executives and the board of trustees. He held other leadership positions at the University of Pennsylvania and Duke and, earlier in his career, worked at KPMG and Glaxo Pharmaceuticals. Mandl graduated with distinction from George Washington University. He earned a master’s degree in liberal studies from Duke University and held fellowships for doctoral work at Duke’s Fuqua School of Business and the University of Michigan Business School. In 2014, University HealthSystem Consortium (UHC), a national organization composed of most of the nation's leading academic medical centers, ranked Emory University Hospital (combined with Emory University Orthopaedics & Spine Hospital) eighth nationally in the UHC Quality Leadership Awards. This is the fourth consecutive year that Emory University Hospital has ranked in the top 10 for demonstrating superior performance in delivering high-quality care and safety excellence. Emory Healthcare's core purpose is "To serve humanity by improving health through integration of education, discovery, and health care." For more information, visit www.emoryhealthcare.org.